ENL's ethical posture, which is based on the equal worth of human beings, does not preclude inequality if this increases health for all. Equality (sameness) is not synonymous with equity (fairness), and that the two must be distinguished if we are to rationally apply ENL’s ethical position. Here this stance is addressed in more depth, using the concept of individual net gains (ING). Let’s begin with a society that is perfectly equal in the economic sense, as depicted in the following figure. 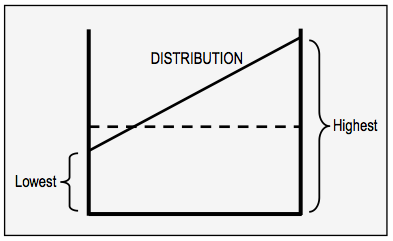 An economy’s distribution pattern is represented by a line that indicates the individual net gains (ING) for those at the low end relative to those at the high end. 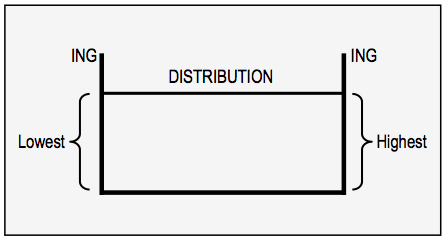 A horizontal line, as in the figure, indicates perfect equality in ING distribution. ￼In this and subsequent figures on this page, the vertical direction indicates the achievement of ING. 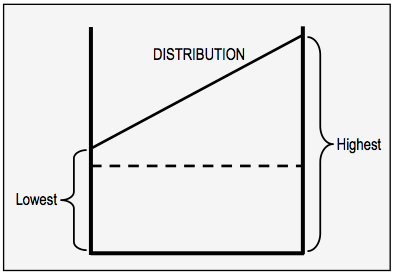 The line marked “distribution” indicates the relative ING achieved by those at the lowest level (left side) and those at the highest level (right side). A horizontal line signifies that ING is the same for everyone, which is the definition of perfect equality. Now assume that an economic change is being considered that would increase ING significantly for those at the high end while decreasing it slightly for those at the low end, as in the following figure. Many have gained, but some have lost. Based on ENL’s ethical principle of equal human worth, the many cannot be unrealized gains allowed to gain at the expense of the few. ENL thus rejects this type of inequality on ethical grounds. The old distribution line is hashed; the new one is solid. It is visually clear that the ING gained at the high end far exceeds the ING lost at the low end. On aggregate, therefore, society has increased its health with this shift. However, the new distribution violates ENL’s ethical principle. People are of equal worth, and it is therefore unjustifiable to deprive some for the benefit of others. It is irrelevant that the aggregate gain is substantial — no gain can be justified if it is ethically unsound. For a society that bases its economy on ENL, the change being considered must therefore be rejected. Now consider another possibility: everyone’s ING increases, and no-one’s ING decreases. This is depicted in the following figure. Here everyone’s ING has increased, although some have gained more than for others. Because all gain, and because the inequality is the minimum required to achieve this gain, ENL considers the inequality to be justified. A society must decide on non-economic grounds if this level of inequality is nevertheless inequitable and should therefore be rejected. ￼￼￼￼In this situation those at the low end have gained a little, and those at the high end have gained a lot. No-one ends up with a lower level of health, and no-one has therefore been deprived for the benefit of others. This change is consistent with ENL's ethical principle, and from the economic perspective it should therefore be permitted. However society may decide that the new distribution is inequitable — that is, it may judge that the perceived lack of fairness will result in unacceptable levels of stress, envy, conflict, loss of social solidarity, criminal behavior, etc. Because these negative social consequences could easily overwhelm the increased economic benefits, they must be carefully considered. A society could also decide that the new distribution is unnecessarily unequal. The only reason to countenance inequality in the first place is because, given the realities of human nature, this is the only way to achieve a general increase in ING. Those with exceptional energy and organizational talents frequently demand more than the average in order to perform their tasks. Society must decide if such demands are reasonable, thus determining if the inequality is in this sense necessary. The inequality principle outlined here is applied to ING — that is, to the health derived from consumption and production. Note, however, that it could also be applied to want satisfaction and to socially-defined well-being. It may even be useful to extend the principle to the distribution of labor and wastes, although this avenue has not yet been explored in depth.